Golf Club at Vistoso is located in Rancho Vistoso a Master Planned Community in Oro Valley, AZ. Tom Wieskopf designed this course and has achieved a very playable, yet demanding, 18 holes of golf. This is a desert golf course requiring relatively long carries off the tee and a premium on accuracy on every shot. The Golf Club at Vistoso is a great track. It has been ranked in ” Golf Magazine’s Top 100″. The course is a favorite among locals and visitors alike. With 4 sets of tees, the course can play “really tough” to “moderately tough”. From the Back and Regular Tees forced carries can be visually intimidating. The 14th hole is a drivable par 4, but be careful, its named “Risky” for a reason. 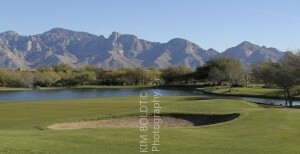 Take note of the 166-yard par 3 third hole – on a clear day (there are only 323 of them) you will have an amazing view of the north side of the Santa Catalina Mountains. As you finish your round, you will see the Vistoso Resort Casitas on the 17th and 18th holes. The casitas offer a variety of floor plans from 1 to 3 bedroom and are great of winter get aways or second homes. There is a site rental program of these units. The Golf Club at Vistoso is located in the Master Planned Community of Rancho Vistoso. Rancho Vistoso is in Oro Valley Arizona. The course is easy to get to from almost any where in the Oro Valley area and Northwest Tucson. Townhomes for Sale Tucson are found near the Golf Club At Vistoso. Interested in a winter retreat or golf get away home? We can help. Questions about Tucson Homes, Tucson Real Estate Market or Homes for Sale near the Golf Club at Vistoso? Call Us 866 316 5575 OR complete the CONTACT FORM and we will get right back to you!